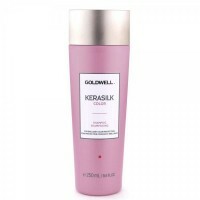 Buy online Goldwell Kerasilk color intensive luster mask 200ml/6.7 fl.oz. Goldwell Kerasilk color intensive luster mask 200ml/6.7 fl.oz. Directions: Apply to wet or towel dry hair, distribute and wait for 5-10 minutes. Rinse well. Model: Kerasilk color intensive luster mask 200ml/6.7 fl.oz.